From beach hikes to mountain summits, waterlogged rainforests to trails in the rain shadow, Olympic National Park is a paradise of remote and gorgeous destinations. While remote access can be enormously rewarding, the logistics can be prohibitive for some: those with young children or mobility issues know full well that these spots can be off the table. The great thing about Olympic National Park (and most) national parks, however, is the trove of incredible adventures that are more easily accessible and just as gorgeous. Many of these adventures come with some infrastructure that can make your trip a little easier to execute, as well: restrooms, nearby campgrounds, and even conveniences like restaurants, rentals, and stores can save the day in a pinch. When the realities of your situation require a less ambitious agenda, it helps to forget where you can't go and focus on where you can. With that in mind, here are 10 suggestions for some easy, family-friendly adventures in Olympic National Park. Access to this falls is on an easy, well-maintained trail that leads through a beautiful forest of hemlock and fir to the impressive falls. The Sol Duc River rushes headlong off of a 50-foot drop, but not before it is divided into three sections by a pair of imposing teeth at the top. Viewing platforms are situated around the falls so you can safely see the formation from points low and high. This beautiful falls is a very popular stop, and for good reason. 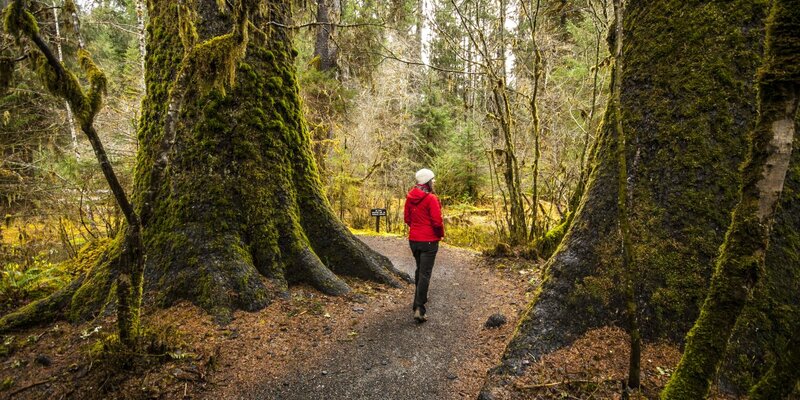 Visitors to the nearby Sol Duc Campground and Sol Duc Hot Springs Resort can easily make the hike and, if energy and schedules allow, proceed farther up the trail for more adventure. Walking the Hall of Moss Trail in the Hoh Rainforest. Photo by Tyson Gillard. The Hoh Rainforest receives an enormous amount of rain annually, making it one of the wettest places in the U.S. This section of the park is really a unique spot, and there are several options for hikes that are short and long. These two short hikes provide a great taste of what this lush ecosystem has to offer in terms of flora and fauna. Because these trails are short, you'll be able to take your time and quietly observe the area; you'll be amazed at how much more you can see in an area like this when the pace is slowed down a bit! The southern portion of Olympic National Park gets much less attention than the higher profile stops along the coast or in the mountains, yet there's no lack of beautiful terrain there. This short loop leaving from Staircase Campground is a perfect illustration. In just a few steps you'll leave the campground behind for a dense forest that feels like another world. The trail rejoins the river just in time to see Staircase Rapids, a water feature worth spending some time appreciating. Powerful at high water, meditative at low water, Staircase Rapids makes for a fantastic and easily achievable destination year round. Tide pools at La Push, Second Beach. Photo by Tyson Gillard. This beach is a stunning stop and is easily accessible via a short, 0.7-mile access trail. You'll see some of the most impressive sea stack formations in the park such as Crying Lady Rock and the Quillayute Needles, part of the Washington Maritime National Wildlife Refuge Complex. Keep your eyes peeled for larger ocean-going mammals, but don't overlook the sea life at your feet, either. No visit to the Pacific Coast would be complete without some time spent around tide pools, and Second Beach has an abundance to explore at low tide. Plan to spend good amount of time here, as the wildlife thrives in this protected environment. 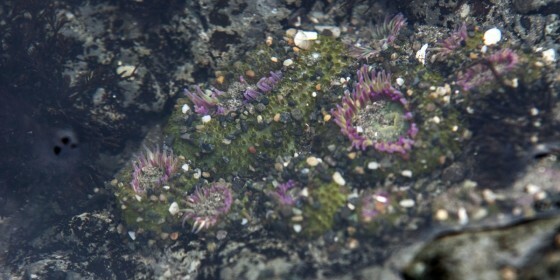 Continue your exploration of Olympic National Park's tide pools with a visit to Kalaoch Beach 4. This impressive beach is also part of the Olympic Coast National Marine Sanctuary, and low tide reveals a bonanza of aquatic life. Sea stars, anemones, urchins, and rocks covered in mussels and limpets are all on display. In the distance, the Destruction Island Lighthouse stands alone and nearly forgotten. A short access trail leads to the beach, and while the going gets a little steep, the stairs built into the trail keep the grade manageable. Lake Crescent is one of the highlights of Olympic National Park, and it is also one of its most accessible destinations. Located just off of Highway 101 at the far western tip of the lake, Fairholme Beach enjoys the full extent of the day's sun and offers a the protection of a designated swimming area. While it is easy enough to find the deep water, the lake's bottom slopes gradually in places and offers some safe options for new swimmers and parents. Nearby Fairholme Campground is a great choice for longer stays at the lake, and the general store is there for last minute items. You'll also be able to rent canoes and kayaks on site! And if you are there for a full day, you may want to check out a short hike on one of the many nearby trails such as the Olympic Discovery Trail that runs along the north shore of Lake Crescent. Lake Crescent from Lake Crescent Lodge Beach. Photo by Tyson Gillard. 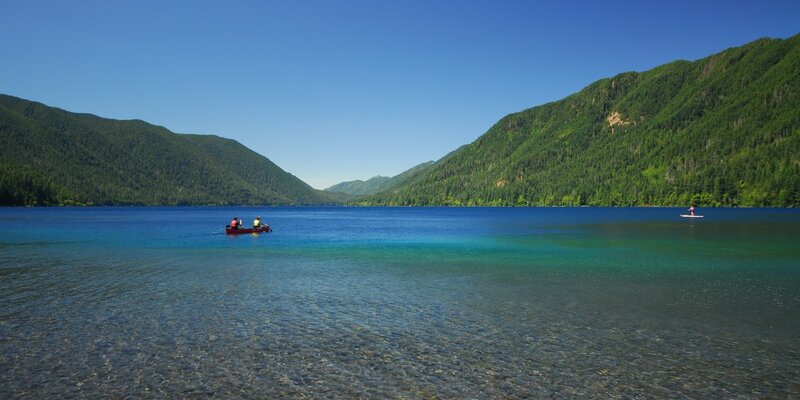 In contrast to Fairholme Beach, Lake Crescent Lodge and beach is located closer to the central portion of Lake Crescent's south shore. The Barns Point area is home to several adventures leaving from near the Storm King Ranger Station, and the historic Lake Crescent Lodge sits on the point's western shores with a lovely beach that's a destination in its own right. You might want to choose between Fairholme Beach and Lake Crescent Lodge Beach based on the weather: they face opposite directions, so winds that blow on one may favor another. The lodge itself is a unique draw as well, offering a window into the park's history as well as a full range of supporting amenities such as a restaurant and shop. Like Fairholme, this beach is a great fit for young kids; the designated swimming area includes a large, gradually sloping lake bottom that is ideal for wading. If you do opt for the Lake Crescent Lodge Beach, the nearby Marymere Falls Hike is a great way to add variety to your day. A short hike in the morning can tee-up a perfect afternoon at the lake, and at 1.8 miles round-trip, Marymere Falls is an ideal complement. Unlike the equally remarkable Sol Duc Falls, Marymere Falls is a long, delicate horsetail falls formed as Falls Creek plunges over a 90-foot drop. Viewpoints are established so your party can safely explore the different perspectives on the cascade. Wildflowers and the Olympic Mountains from the Hurricane Hill Trail. Photo by Tyson Gillard. 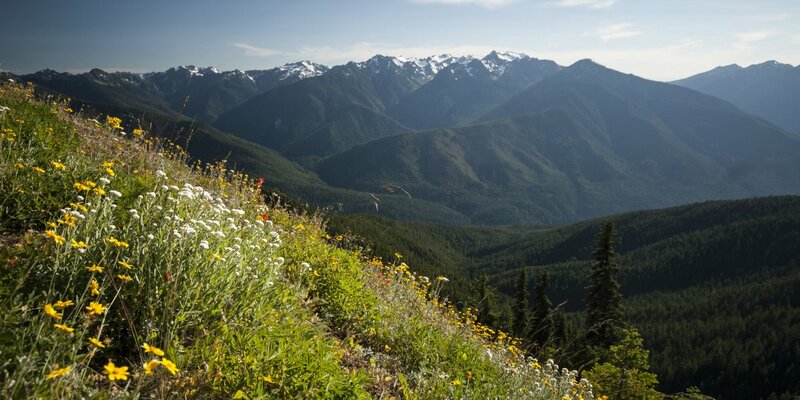 Thanks to Hurricane Ridge Road, the high country in Olympic National Park is easily accessible. This is one of the most visited areas in the park, so don't expect to be alone up here; the best approach is to focus on the tremendous views, wildflowers, and wildlife, and let the crowds sort themselves out. The Hurricane Hill Trail is a perfect example of a trail that gets plenty of attention while remaining one of the most rewarding walks in the park. The wide path is built out to easily accommodate groups, and the short, easy hike is doable for hikers of all abilities. And the views are tremendous: in addition to the close-ups of the Olympic Peaks including Mount Olympus, you'll get views into the Elwha Valley, the Strait of Juan de Fuca, and even Mount Baker to the northeast. The nearby Hurricane Ridge Visitor Center is there for any necessary restrooms and information stops as well. Sunrise Point from the Klahhane Ridge Trail. Photo by Tyson Gillard. 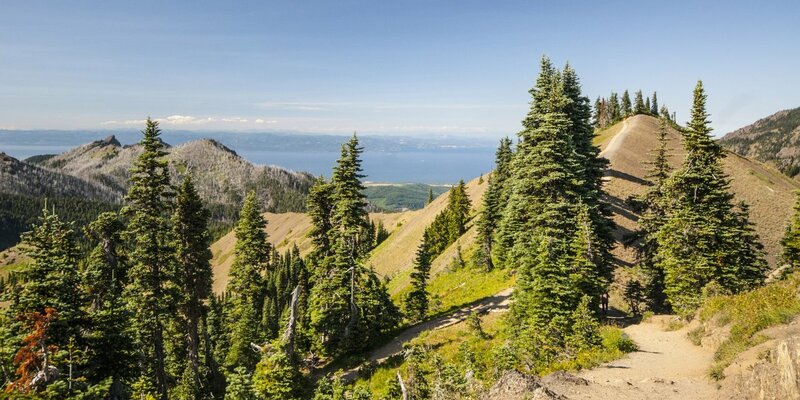 Several excellent trails leave directly from the Hurricane Ridge Visitor Center, and all are modest walks designed for maximum accessibility (some are even paved). One of the best and most rewarding options is to head to Sunrise Point, a short hike that can be anywhere from 1 to 2 miles round trip, depending on the trails you take to reach the Sunrise Point Trail itself. You'll have some elevation gain to reach the point, but this is a very easy walk, especially if you stop along the way to enjoy the views. Sunrise Point provides an intimate look at nearby Mount Angeles, accessed by the Klahhane Ridge Trail that splits off to the right on your way up. You'll also get to see Hurricane Hill and some amazing southern views into the park. Have a funny, impressive, or absolutely strange story to tell about your family trip into the Olympics? Of course you do, and we'd love to hear about it! Leave a note and/or a photo in the comments section and share the love.